Indiana - The General Screw Steam Shipping Co. Ltd. Depth: 32 4/10 feet. 25 3/10 feet depth of hold. Machinery: 300h.p. by Maudslay, Sons & Field. Engine Room 55 5/10 feet long and 566 2/10 tons. 1 funnel. 9 knots. Built of: Frame work of plated iron. Type: Barque type auxiliary screw with three masts. Clipper bow. Registered: No.301 on 31st August 1852 in London. Other info: 120 men. Female Figure Head. Square stern. Rigged with a standing bowsprit. History: 19th August 1847. Ordered and built for James Lyster O’Beine of Cannon Street in the City of London, Secretary to the G.S.S.S.Co. and incorporated by Royal Charter. 10th September 1852. Due to sail from East India Docks for Plymouth. Captain George Patrick Lambert. 15th September 1852. Sailed from Plymouth, Captain Patrick Lambert, for Cape of Good Hope and Calcutta. 11th October 1852. Sailed from Ascension. 27th October 1852. Arrived at Cape Town. 30th October 1952. Sailed from Cape Town for Mauritius and Ceylon. 22nd November 1852. Passed ‘Lady Joyelyn’ off Point de Galle for Madras. 19th December 1852. Sailed from Calcutta. 22nd December 1852. Arrived at Madras. 23rd December 1852. Arrived and sailed from Madras. 26th December 1852. Arrived at Point de Galle. 28th December 1852. Sailed from Point de Galle. 7th January 1853. Arrived at Mauritius. 9th January 1853. Sailed from Mauritius. 17th January 1853. Had to Lay-to eastward of Algoa Bay due to a gale for 24 hours. 21st January 1853. Arrived at the Cape of Good Hope. She had been detained between Ceylon and Calcutta owing to there being only a scanty supply of coal at Galle, and although a plentiful stock awaited her arrival at Madras, the weather was so boisterous she was only enabled to take off about thirty-five tons, barely sufficient to bring her half-way up the bay against the strong monsoon then blowing and she was afterwards compelled to beat up under sail. 24th January 1853. Sailed from the Cape of Good Hope. 1st February 1853. Arrived and sailed from St.Helena. 4th February 1853. Arrived and sailed from Ascension. 12th February 1853. Arrived at St.Vincent. 15th February 1853. Sailed from St.Vincent. 26th February 1853. Arrived at Plymouth from India. 27th February 1853. Arrived at Southampton with a cargo of raw silks in number less bales, silk piece goods, chests of lacquer, ditto indigo, ivory in tusks and cases, saltpetre, etc. 14th April 1853. Sailed from Plymouth for Calcutta. Captain G.P. Lambert, with a full cargo, leaving same behind, plus £80,000 in specie, and two carriages from Jones’s manufactory for Port Louis. She took out 65 passengers. 26th April 1853. Arrived at St. Vincent. Coaling took ten days and six hours. 6th May 1853. Arrived at Ascension. 22nd May 1853. Arrived at the Cape of Good Hope. She brought forty passengers and a large cargo with £80,000 specie. 26th May 1853. Sailed from Cape of Good Hope. 18th June 1853. Sailed from Point de Galle. 22nd June 1853. Sailed from Madras. 26th June 1853. Arrived at Calcutta, two days before estimated time. 12th July 1853. The ship 'Sydney' was lost. She had a cargo of coal for fuel for the 'Indiana'. 15th July 1853. Sailed from Calcutta for Plymouth. 21st July 1853. Arrived from Madras. 24th July 1853. Arrived at Ceylon. She took on a considerable quantity of cinnamon. 25th July 1853. Sailed from Ceylon. 6th August 1853. Arrived at Mauritius. Under quarantine all the time due to cholera and smallpox there. The passengers for shore were placed in a lazaretto for 12 days before they were permitted to go shore. 7th August 1853. Sailed from Mauritius. 18th August 1853. Arrived at Cape Town. 20th August 1853. Sailed from the Cape of Good Hope, just as the ‘Sir Robert Peel’ arrived. 29th August 1853. Sailed from St. Helena. 2nd September 1853. Sailed from Ascension. 9th September 1853. Arrived at St.Vincent. 10th September 1853. Sail from St.Vincent. 25th September 1853. Arrived at Virgo. To pick up some coal due to calm weather. 27th September 1853. Arrived at Plymouth from Calcutta, with fifty-one passengers and a full cargo consisting of 60 cases and 87 bales of silk, 67 chests of indigo, 302 bales of safflower, 430 bags of saltpetre, 25 cases of lac dye, 1307 slabs of tin, 445 bags of coffee (Ceylon), 33 bales of skins, 1583 bales of cinnamon, and 60 packages of sundries. 14th November 1853. Sailed from Southampton, Captain G. P. Lambert, for Calcutta with 91 passengers. She had a large cargo of manufactured goods, specie of over £20,000 and 500 bottles of quicksilver. 15th November 1853. Arrived at Plymouth and sailed for Cape Town. 22nd December 1853. Arrived at the Cape of Good Hope. 27th December 1853. Sailed from Cape Town. 16th March 1854. Sailed from Calcutta for Plymouth. Captain Lambert. 20th March 1854. Sailed from Madras. 24th March 1854. Sailed from Ceylon. 4th April 1854. Sailed from Mauritius. 15th April 1854. Arrived at Table Bay. She completed her coaling on the 18th, but was detained by order of the Lieutenant-Governor, the reason given being that she had arrived before her contract time. 21st April 1854. Sailed from Table Bay. 29th April 1854. Sailed from St. Helena. 2nd May 1854. Sailed from Ascension. 12th May 1854. Sailed from St.Vincent's. 23rd May 1854. Sailed from Lisbon. Put in for coal. 27th May 1854. Arrived at Plymouth from Calcutta. 8th July 1854. Sailed from Southampton for Havre. 16th July 1854. Sailed from Southampton for New York, after having previously gone to Havre for passengers and cargo, on a trial voyage. Captain Lambert. 90 passengers. 24th July 1854. Expected to arrive at New York. 1st August 1854. Arrived at New York after headwinds the entire voyage. At one time it was so bad she had to lay to for twenty-four hours. The Directors of the Company are well satisfied with the performance of the ship and will be altering other vessels for the purpose of enabling them to carry more passengers to America. 10th August 1854. Sailed from New York for Southampton. 23rd August 1854. Arrived at Southampton from New York, with seventy passengers. August 1854. In for a refit. 29th August 1854. William Edward Harvey was killed by a piece of wood falling from the foretop mast. 4th September 1854. Due to sail from Southampton for New York. Captain Lambert. 25th September 1854. Registered by George Patrick Lambert in Southampton. 3rd October 1854. Left Havre for Southampton. 4th October 1854. Arrived at Southampton to embark passengers, 270 steerage, 100 first class, and supplies for New York. Sailed for New York same day. 17th November 1854. Arrived at Southampton from New York with 59 passengers, plus a cargo consisting of 545 bales of hops, 1600 boxes of cheese, 300 cases of leather cloth, 40,000lbs of whalebone, 2,000 barrels of choice apples, etc., etc. 22nd November 1854. Sailed for Toulon, Captain Lambert, with troops for the East. 29th November 1854. Appointed to sail for New York but has been chartered by the Government to convey troops to the Crimea. Transport ? 147. 15th April 1855. Arrived at Spithead at 6 a.m. with 263 military invalids from Scutari. 16th April 1855. Went into Portsmouth harbour just after midnight. The Acting-Assisting Quartermaster-General Dalgetty then went on board, and arranged for the cases that required stretchers to be removed at once into sick quarters at Portsmouth; there were only 17 in number; those who go to the Invalid Depot at Chatham remain on board until day light when they will land and proceed by railway. The ship is admirably fitted-up ship, better than any yet for the comfortable accommodation of sick and wounded, having been originally fitted up for German emigrants of a superior class. 17th April 1855. Arrived at Southampton from Portsmouth to prepare to convey cavalry to the Crimea. 1st May 1855. Has been fitted for conveying 225 cavalry horses and sailed for Woolwich. 7th May 1855. At Genoa. 10th July 1855. Sailed from Southampton, Captain Lambert, for Devonport, and then to Dublin to embarking cavalry, etc, for the Crimea. 1st October 1855. Steam transport ? 147. Arrived at Spithead from the East with officers and soldier’s invalids. Three deaths occurred on the passage. Later on in the day she went into Portsmouth Harbour to land her sick. 5th October 1855. Sailed from Portsmouth for Southampton. 25th October 1855. Sailed from Southampton for the Crimea, with 28 officers, 19 servants, 755 men and 54 horses. 26th October 1855. Anchored in Plymouth Sound due to bad weather. 2nd January 1856. Registered by John Baker in Portsmouth, ? 474. 2nd January 1856. At Portsmouth a detachment of 150 non-commissioned officers and privates, including 23 drivers, of the Royal Sappers Corps, embarked this afternoon for conveyance to the East. The Sappers and Miners came from Woolwich and Chatham, and are designed to fill up vacancies in the different companies of that corps in the Crimea. Sixty horses also embarked, 24 of which belong to the Sappers and Miners, and the remainder to the Land Transport Corps. 3rd January 1856. Sailed from Portsmouth for the Crimea with draughts of troops and a body of the Land Transport Corps. Transport ? 147. 11th January 1856. Arrived at Gibraltar. 13th January 1856. Sailed from Gibraltar. Spoke with the ‘Alma’. 18th January 1856. Spoke to the ‘Qrient’, 30 miles east of Scilly. 28th February 1856. Sailed from Malta for the Crimea with 36 officers and 906 non-commissioned officers and privates of various regiments, taken from the Malta reserve. 19th April 1856. Passed Deal for Geelong. 23rd May 1856. At Sabastopol embarked detachments of the Royal Artillery and sailed. 25th May 1856. Arrived at Constantinople. 5th June 1856. Arrived at Gibraltar. 13th June 1856. Arrived at Spithead. 9th May – 31st August 1857. 3 round trip voyages, Bremen – Southampton – New York. 22nd May 1857. Spoken to in lat. 10S, long 83E. 10th June 1857. Sailed from New York. Captain Baker. 25th June 1857. Arrived at Southampton, in the afternoon, with 160 passengers (of which 56 were first class), and a general cargo of 1,995 bushels of corn, 81 bales of cotton, 5,251 pounds of whalebone, and miscellaneous merchandise. The passengers presented the captain with a very complimentary address. After disembarking her passengers, etc, and taking in coal, she proceeded to Bremen. 2nd September 1857. Arrived at Southampton from Bremen, Captain Baker. 2rd September 1857. Sailed from Southampton in the evening for New York with 520 passengers, mail, 65,000 dollars in specie, and a full cargo of general merchandise. 30th September 1857. Sailed from New York at 5 p.m.
9th October 1857. Spoken to bound east. 11th October 1857. Arrived at St. John’s at daylight, from New York, after bad weather and short of fuel. 13th October 1857. Sailed from St. John’s at 8 p.m.
23rd October 1857. Arrived at Cowes, coaled, then proceeded on to London. 25th October 1857. Arrived at Gravesend from New York with 132 passengers and a full general cargo. 29th October 1857. Arrived and anchored at Deal from London for Valparaiso. 2nd November 1857. Arrived at Plymouth from London. Captain Baker. 20th February 1858. Registered by George Patrick Lambert in Southampton, ? 1456. 20th February 1858. The European and American Company’s screw steamer, Captain G. P. Lambert, is fitting out in dock (Southampton) for troop service, having been chartered by the East India Company for the conveyance of soldiers to Calcutta. She will be ready for sea in a few days. 5th March 1858. Embarked troops from Chatham at Gravesend for Calcutta. 18th March 1858. Arrived at St. Vincent – crew and troops all well. 19th March 1858. The Portuguese General and Staff dined on board and inspected the ship. 20th March 1858. One of the soldiers died in the morning from sun stroke; the heat at St. Vincent was very oppressive. The ‘Indiana’ later sailed from St. Vincent. 16th April 1858. Arrived at the Cape of Good Hope from England with 700 draughts. 19th April 1858. Sailed from the Cape of Good Hope. 13th May 1858. Mr. Caldwell, passenger from the Cape, died at sea. 16th May 1858. Arrived at Point de Galle in the morning. 17th May 1858. Sailed from Point de Galle for Calcutta. 23rd May 1858. Arrived at Calcutta. 1st July 1858. Sailed from Calcutta. 8th July 1858. Lieutenant the Hon. C. Ward died at sea. 22nd September 1858. Arrived in the morning at Plymouth with 111 invalided soldiers, 8 women, and 12 children. 24th September 1858. Arrived at Gravesend from Calcutta and landed the wounded and disabled troops, who were all immediately conveyed to Fort Pitt Hospital, Chatham. Many of the troops have received desperate wounds in their conflicts with the mutineers at Allumbagh and Lucknow. 6th February 1860. Registered by Saul N. O. Wright in London, ? 442. 27th February 1860. Passed Deal from London for Corfu. Captain S. Wright. 2nd March 1860. Sailed from Portsmouth with troops for Gibraltar and Corfu at 6 p.m. She remained alongside the dockyard the night before, to give time for the troops to settle down in their berths. 10th March 1860. Arrived at Gibraltar. 11th March 1860. Sailed at 1 p.m. from Gibraltar for Corfu. 26th March 1860. Arrived at Gravesend from Hong Kong. 16th September 1861. Arrived at Madras. 2nd February 1861. Arrived at Gravesend from Madras. 16th April 1861. Registered in London by J. Peppercorne, ? 2664. 11th November 1861. Mr. James Curr died on board during the voyage from Calcutta to London. 5th April 1862. Sailed from Gravesend for Calcutta, for the East India and London Company. 7th April 1862. Passed Deal, in tow for Calcutta. 15th August 1862. Sailed from Calcutta, Captain Suckling. 7th September 1862. Sailed from Madras. 23rd October 1862. Rounded the Cape. 12th November 1862. Touched at Ascension. 17th November 1862. Crossed the Line. 18th December 1862. Arrived at Plymouth with a full general cargo of linseed, cotton, silk, etc. She had 12 passengers. 23rd December 1862. Arrived at Gravesend from Calcutta. 20th April 1863. Sailed from Gravesend for Calcutta. 19th November 1863. Sailed from Gravesend from Calcutta. 23rd November 1863. Passed Deal. 11th January 1864. Sailed from Gravesend in the morning and anchored off the Nore Light Ship that night. 12th January 1864. Sailed in thick foggy weather. 14th January 1864. Captain John Smyth, bound to the Cape of Good Hope. Madras, and Calcutta, was off the port of Plymouth with a full cargo and 70 passengers. 19th May 1864. Sailed from Calcutta with cargo consisting of saltpetre, seeds, cotton, silks, sugar, etc. plus 100 passengers. 2nd June 1864. Sailed from Madras. 13th July 1864. Sailed from the Cape of Good Hope. 28th July 1864. Crossed the Line. 22nd August 1864. Arrived at Plymouth. 25th August 1864. Sailed from Gravesend for Calcutta. 24th August 1864. Passed Deal for Calcutta. 9th March 1865. Passed Deal from London for Kurichee. 28th March 1865. Passed Deal for London from Port Natal. June 1865. Owned by P. W. Pelly, etc. 23rd September 1866. Sailed from Liverpool for Singapore. 23rd September 1867. Passed Deal from Hartlepool for Madras. December 1867. Owned by S. Boult. April 1868. Owned by J. Park. 25th April 1868. Spoken to 7N. 87E for London. 8th September 1868. Arrived at Gravesend from Bitralipotam. 2nd January 1869. Sailed from London for Singapore but had to put back as she was in collision during a gale in the night while at anchor in the Downs, with the bark ‘St.Olaf’ and carried away her foremast, bowsprit, and received other damage. 4th January 1869. Arrived back at West India Dock. 15th February 1870. Spoken to in lat 4N. long 2W. for London from Madras. 10th March 1870. Arrived at Barbados from Cork. 1st August 1870. Arrived at Liverpool from Pensascola. 1870. Renamed ‘Ferdinand De Lesseps’. British. 1873. Renamed ‘Great Queensland’, engines removed, and rigged as a bark. 2nd September 1873. Arrived at Queensland, Australia. 17th June 1874. Sailed from London for Harvey Bay, Australia, Captain George Holder. Surgeon. Dr. A. R. Miller. Matron. Mrs. Cochot. 9th October 1874. Arrived at Harvey Bay, Australia. 18th November 1875. Arrived at Queensland, Australia. 1. Last sighted 26th August; a few pieces of wreckage were picked up off Cape Finisterre. 2. A tremendous explosion was seen at sea on 12th August. 3. She may have blown up when off the western Victorian coast. January 1877. Registry closed. 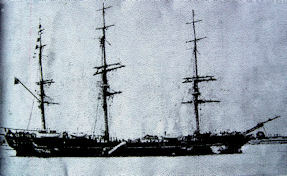 No news of vessel since 12th December 1876, owners consider her lost.